True Blue Aussie Cake Recipes - and so much more!!! This page is devoted to Cake Recipes - including biscuits, scones, slices and all other deviations on the theme. Imagine an Australian kitchen, and you immediately imagine cakes, biscuits, scones, pikelets and slices. Remember the various wonders that your mother and grandmother used to bake from scratch - and always have tucked away in a tin in the pantry? Those were the days when friends would visit and would always be offered something sweet with their cuppa. With inflation and two income earners in a family, sadly the art of baking has slowly deteriorated - so that if a cake exists in a kitchen, it is usually either purchased or baked from a packet mix. The recipes which I am including on this page are baked from scratch, though some do have some little short cuts that are fantastic if you need to prepare something in a rush. 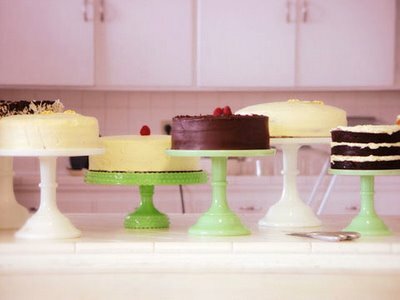 Do you have a favourite Cake recipe to share? Over the years, I have met many many women who claim to have "the perfect" sponge cake recipe. Luckily for me, they have all been very happy to share the recipes with me, and although I have tried them all, I find it almost impossible to choose a favourite.